Lauren Trout of Saila Bicycles. Photo from Saila Bicycles’ Facebook. There’s something appropriate about a relatively unknown frame builder working under the name Saila (that’s alias spelled backwards). 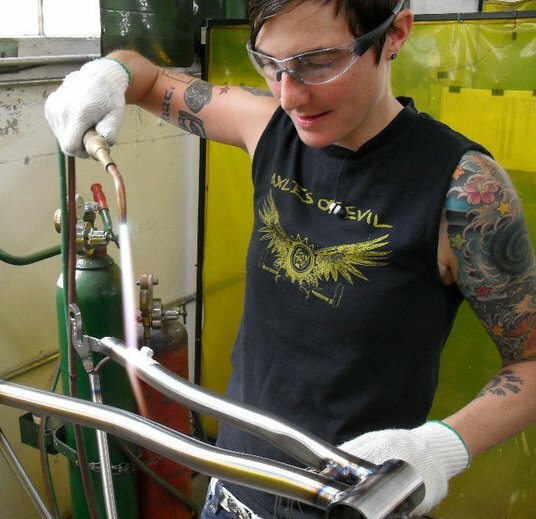 But though she’s not a household name, Lauren Trout’s got nearly a decade of experience under her belt building some of the world’s nicest titanium bikes. Those years rival or surpass plenty of big name builders with even bigger “personal brands.” Trout learned to wield a torch after getting hired as an entry-level finisher at Seven Cycles. She worked her way up to the production welding department where she spent years honing her skills building thousands of bikes. Last year she left Boston for Austin, Texas and went full time with her one-woman shop, Saila Bicycles. I spoke to Trout about her experience at Seven, striking out on her own, her long history as a bike messenger, the faddish explosion of custom companies, and much more.